On Sunday 11th September 2005 Light Design Group supplied lighting equipment and production management services for the PLASA Exhibition held at Earls Court Exhibition Centre, Light Design Group was commissioned by event co-ordinator Sophie Mathews following recommendation from IDJ Magazine and Most Wanted Global. Our brief was simple! 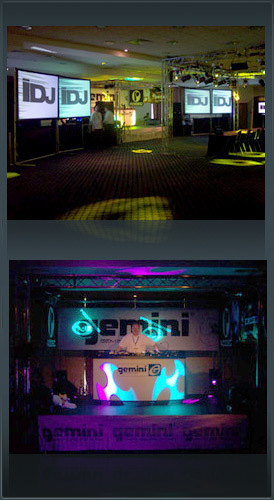 - To turn the Cromwell Suite, a standard function suite, into a dance, club environment. Providing high-end video projection, subtle ambient lighting for the talk stage and to manage the event production. This was successfully achieved using 3 separate truss rigs, over 30 moving lights, including heads from Robe and Pearl River, 20 par cans, 4 projection screens, 2 plasma displays and ETC dimming, all controlled by an Avolites Pearl Lighting Desk. Video animations were supplied and operated by Nuroptics with Sound and Audio equipment supplied by Gemini. Light Design Group would like the thank PLASA, IDJ Magazine and GEMINI for allowing us to work on this project. We would also like to thank Nuroptics and Light Design Group Power, our sister power company, for supplying their services. Through our sister companies, RILL Lasers and Light Design Group Power, we also exhibited at the exhibition with a new range of lasers and power distribution equipment. Please go the links section and visit their websites for further information.